Damie gets roll in shower! Ten-year-old Damie and his family are so happy! 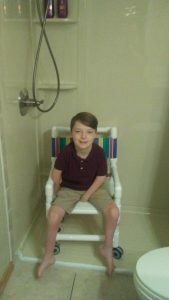 They now have a roll in shower and a new shower chair! They asked wheelchairs 4 kids for help with a bathroom modification so we teamed up with area businesses to make it happen. 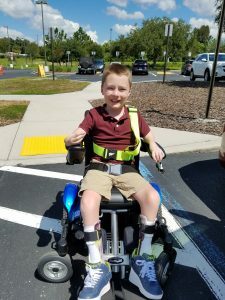 Damie was diagnosed with several conditions, including anthrogryposis and hypotonia. He is unable to walk without assistance. Most of the time, he uses a motorized wheelchair for mobility. Damie remains a very positive child even with his limitations. Damie, who loves to have fun, has many favorite activities. He enjoys busting a few moves to upbeat music, especially when he hears songs by 21 Pilots. Damie is also a very artistic child. He will spend time carefully drawing colorful characters. Sometimes he likes to relax and play video games. In fact, he would like to design games as a career. More importantly, Damie is outgoing and loves talking with new people. Girls adore Damie, too. They write him letters and he loves the attention. He is irresistible! Previously, Damie’s parents had to carry him and place him in the old bathtub. Since he is growing, this couldn’t have come at a better time for him and his family. The much needed roll in shower will make bathing easier and safer for him and his caregivers.